Administrators - Management and users that can work in Manager. Users - Normal users like cashiers, waiters, etc. To change what each user group can open ROBOTILL Manager and click on Setup > System Configuration > General Configuration > System Security. To open this screen, select Setup > System Configuration > General Configuration > System Security. Select the POS function (void sale, refunds, cash drop, etc). Select the minimum user group that can perform this action. For example, if you choose Super Users, Super Users and Administrators will be able to perform the task. The list of user groups that can perform this task will be displayed. Click on 'Update this Task' to change the security level for the selected task. See ROBOTILL Manager access below. 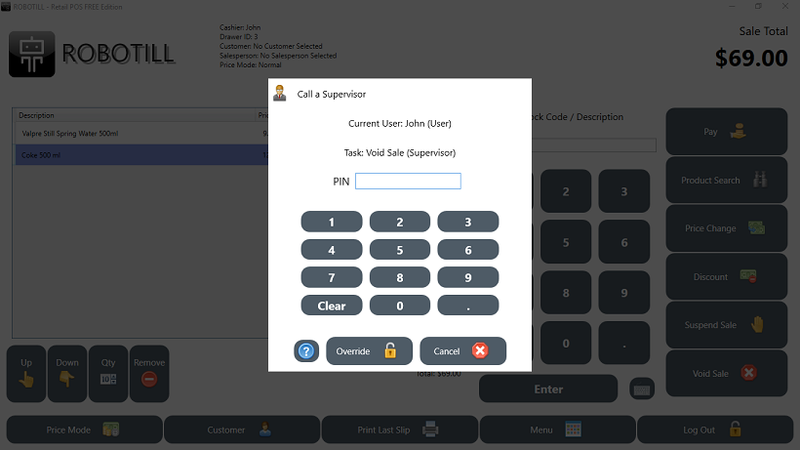 In the POS Screen, if a user wants to perform a task that he does not have the rights to do, the following screen will appear. It will display what the level of the current logged in user (cashier) is and what level is required. The user can then ask a user with the required level (supervisor, manager) to perform a security override. The supervisor/manager can just enter their PIN or swipe/scan their card. If a security override is done, it will be logged in the Event Log. Only Admin and Super Users can log into ROBOTILL Manager. By default, the Super Users can log in but do not have any access to any of the functions in ROBOTILL Manager. 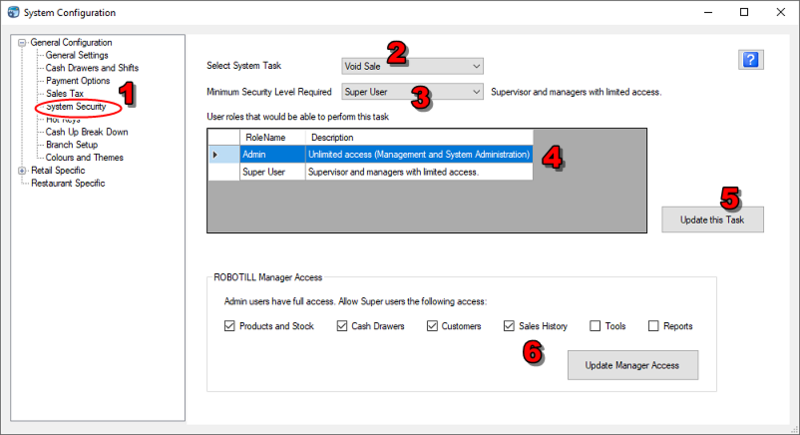 You can choose what access a Super User can have in ROBOTILL Manager (see point 6 in the image on top of this page). This can be used for example if you want a supervisor to work with products and stock but you don't want the supervisors to see the reports. Select the areas in ROBOTILL Manager that you want to allow access and click on 'Update Manager Access'. To log in as a supervisor (Super User), close ROBOTILL Manager and open again.